↑ "Pope resigns, saying no longer has strength to fulfil ministry". Reuters. February 11, 2013. สืบค้นเมื่อ February 11, 2013. 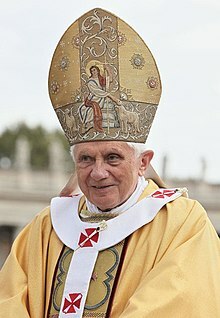 ↑ "Pope Benedict XVI in shock resignation". BBC. February 11, 2013. สืบค้นเมื่อ February 11, 2013. ↑ "Pope Benedict XVI announces his resignation at end of month". Vatican Radio. February 11, 2013. สืบค้นเมื่อ February 11, 2013. หน้านี้แก้ไขล่าสุดเมื่อวันที่ 21 สิงหาคม 2561 เวลา 03:55 น.